Description: Available in 5 1/2" and 7 1/2" barrel lengths. This holster is made to fit most Single Action revolvers. Original maker - E. Goettlich in Helena, M.T. This holster dates between 1889 and 1895. E. Goettlich opened his Miles City shop in 1880. In 1885 he sold out to Al Furstnow and moved to Livingston Montana. By 1889 he had opened a new shop in Helena, where he continued in business until 1937. 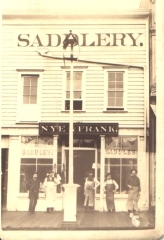 Saddle Shop Photo, Helena, M.T.